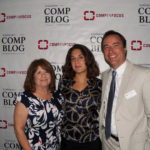 The Monson Law Firm attended the Louisiana Comp Blog’s July “Comp in Focus” Luncheon at Mr. B’s Bistro in New Orleans. “Comp in Focus” is a bimonthly meeting series that addresses emergent issues in the workers’ compensation industry, with speakers from both employer/insurer and claimant/labor sides of the arena. Pictured are Yvonne Rosen, Claims Manger with LCI Workers’ Comp, Nina Luckman, Blog Editor with the Louisiana Comp Blog and Matthew Monson, Esq. Click here to view pictures!